Activity from a supermassive black hole is responsible for the intriguing appearance of this galaxy, 3C305, located about 600 million light years away from Earth. The structures in red and light blue are X-ray and optical images from the Chandra X-ray Observatory and Hubble Space Telescope respectively. The optical data is from oxygen emission only, and therefore the full extent of the galaxy is not seen. 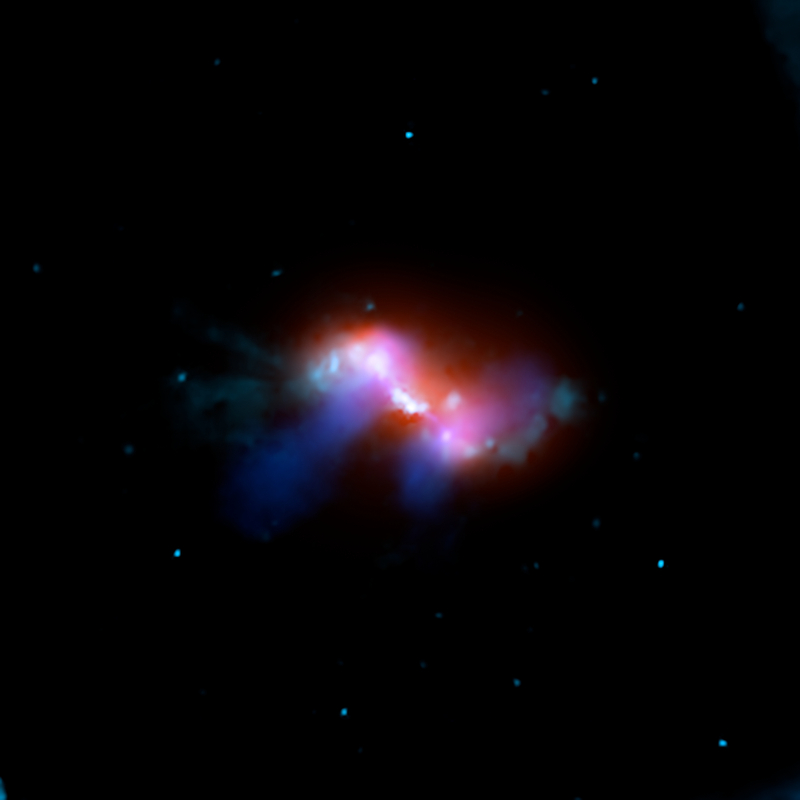 Radio data are shown in darker blue and are from the National Science Foundation's Very Large Array in New Mexico, as well as the Multi-Element Radio-Linked Interferometer Network in the United Kingdom. An unexpected feature of this multiwavelength image of 3C305 is that the radio emission -- produced by a jet from the central black hole -- does not closely overlap with the X-ray data. The X-ray emission does, however, seem to be associated with the optical emission. Using this information, astronomers believe that the X-ray emission could be caused by either one of two different effects. One option is jets from the supermassive black hole (not visible in this image) are interacting with interstellar gas in the galaxy and heating it enough for it to emit X-rays. In this scenario, gas heated by shocks would lie ahead of the jets. The other possibility is that bright radiation from regions close to the black hole infuses enough energy into the interstellar gas to cause it to glow. Deeper X-ray data will be needed to decide between these alternatives. Coordinates (J2000) RA 14h 49m 21.37s | Dec +63° 16´ 14.00"
If you look closely the right hand radio wave is actually emanating from another stellar source to the forefront of the galaxy. I wonder were the two radio wave sources sampled for similar wavelength and Doppler? Thank you very much for showing us different types of space images. I believe that one day a planet like earth will be found out there. the observable Universe which is many billions of light years across. Galaxy 3c305 is at an incredible distance. Is this galaxy toward the edge of our visible universe? What is guess estimated age? Imagine the planets and life there, hummm. Thanks for providing this image.